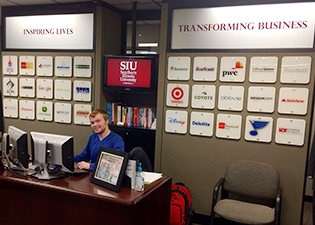 From regular career trips to weekly information sessions to clothing rentals to a virtual career center, the Business Placement Center at Southern Illinois University Carbondale has undergone some visible changes since Danna Lewis took office April 1, 2015. With her one-year anniversary approaching, the director of the only college-focused career and placement center on the SIU campus recounted progress made in the last year, discussed current events and services, shared exciting news about the upcoming launch of a new career portal and other makeover plans on the horizon. In addition to the regular services – such as résumé reviews and mock interviews on a walk-in, open-door policy on Tuesdays from 10 a.m. to 1 p.m., or by appointment – Lewis and her team have transformed the Business Placement Center into an interactive and accessible hub conveniently located on the first floor of Rehn Hall, across from the dean’s office. With this makeover comes an exciting, fully packed event schedule that kicked off in the third week of the spring semester. “We designed a series of events called ‘Working Wednesdays,’ where we highlight different opportunities that assist in preparing our students for the business world,” Lewis said. While the kickoff primarily served as an opportunity for career services staff and students to connect, re-engage and get back into the swing of things, the next event in the series will feature free résumé reviews from established corporate recruiters such as Jessica Smith from Banterra Bank, and her colleagues from Walgreens and The Buckle. The “Résumé Rush” is set to take place Feb. 17. Besides providing tips on writing stellar résumés, the corporate partners of the SIU College of Business will further prepare the students for the upcoming University Career Fair at the SIU Arena. The event will take place from 10 a.m. to 2 p.m. Feb. 23. Programs in the series of “Working Wednesdays” are scheduled for March 9 and April 13, featuring two “Disney Information Sessions” (11 a.m. and noon) to provide helpful advice on how to land one of the highly competitive internships with the mass media and entertainment giant, as well as two “Making the Most of Your Summer” information sessions (10 a.m. to 2 p.m.), respectively, which are intended to encourage students to use their summer time wisely to prepare for their careers. For more details, please consult the event schedule of the College of Business at business.siu.edu. When Lewis and her team aren’t engaging in conversations with students in the center (room 213 in Rehn Hall), chances are they’re either hosting employers on campus for visits and interview sessions, or recruiting employers to recruit business students, or they’re taking students on career trips. The latter in particular is something of which Lewis is very proud. “Last semester we took our students to different companies in the St. Louis area, including Wells Fargo, Edward Jones and the Federal Reserve,” Lewis said. The feedback from the first career trips last semester was overwhelmingly positive. “We had a lot of success with those, and are always looking for new spots to venture to,” Lewis said. In the meantime, Centralia, Illinois, native is excited for the next career trip Feb. 22, which will feature time with the St. Louis Blues of the National Hockey League. Beyond this, there are more positive changes on the horizon for the Business Placement Center: Up next is the launch of a new career portal March 1. Additional plans involve the complete overhaul of the internship program to offer students a more intimate, co-op internship experience starting in spring 2017, and a complete makeover of the website over the summer. But above all, Lewis, an SIU alumna herself, is most excited about the unveiling of another big project. “We are preparing to offer a virtual career center to help our online students,” she said. Lewis also said she’s happy with the progress of the center’s newest initiative: offering professional clothing as rentals to students that might need a business suit for an interview. “We have already a small collection, but if anybody would like to clean out their closets and donate their used business suits, we would gladly accept them,” she said. Although she’s pleased with the accomplishments and progress that has been made in her inaugural year in office, Lewis acknowledges her desire to continue finding more ways build more fruitful relationships with students, employers, alumni and corporate partners to give students a “foot in the door” – and to provide employers an efficient platform to market their products and opportunities. “We were able to place students with companies that we haven’t worked with previously, and that will open the doors for future students,” Lewis said. Last semester, from about 2,000 interactions, 508 were with employers, including phone calls, visits and follow-up emails. The remaining 1,468 student appointments involved taped mock interviews, résumé reviews, questions about employment packages and benefits, and even outfit checks for business dinners or interviews. “Our students are engaged and motivated, and they are very serious when it comes to what their future should look like,” Lewis said. Comparing the job search process with a rollercoaster ride, Lewis’ ultimate vision for the Business Placement Center is for it to grow into a trusted partner for students and employers alike.